The Social Democratic Party of Germany (German: Sozialdemokratische Partei Deutschlands [zoˈtsi̯aːldemoˌkʁaːtɪʃə paɐ̯ˌtaɪ ˈdɔʏtʃlants]), or SPD, is a social-democratic political party in Germany. Led by Andrea Nahles since 2018, the party is one of the two major contemporary political parties in Germany along with the Christian Democratic Union (CDU). The Social Democrats have governed at the federal level in Germany as part of a grand coalition with the CDU and the Christian Social Union (CSU) since December 2013 following the results of the 2013 and 2017 federal elections. The party participates in 14 state governments and 7 of them are governed by SPD Minister-Presidents. The SPD is a member of the Party of European Socialists and initiated the founding of the Progressive Alliance international for social-democratic parties on 22 May 2013 after criticising the Socialist International for its acceptance of authoritarian parties. Established in 1863, the SPD is by far the oldest extant political party represented in the German Parliament and was one of the first Marxist-influenced parties in the world. The General German Workers' Association (Allgemeiner Deutscher Arbeiterverein, ADAV) founded in 1863 and the Social Democratic Workers' Party (Sozialdemokratische Arbeiterpartei Deutschlands, SDAP) founded in 1869 later merged in 1875 under the name Socialist Workers' Party of Germany (Sozialistische Arbeiterpartei Deutschlands, SAPD). From 1878 to 1890, any grouping or meeting that aimed at spreading socialist principles was banned under the Anti-Socialist Laws, but the party still gained support in elections. In 1890, when the ban was lifted and it could again present electoral lists the party adopted its current name. In the years leading up to World War I, the party remained ideologically radical in official principle, although many party officials tended to be moderate in everyday politics. By 1912, the party claimed the most votes of any German party. Despite the agreement of the Second International to oppose World War I, the Social Democrats voted in favor of war in 1914. In response to this and the Bolshevik Revolution, members of the left-wing and of the far-left of the SPD formed alternative parties, first the Spartacus League, then the Independent Social Democratic Party of Germany (USPD) while the more conservative faction was known as the Majority Social Democratic Party of Germany (MSPD). After 1918, the SPD played an important role in the political system of the Weimar Republic, although it took part in coalition governments only in few years (1918–1921, 1923 and 1928–1930). Adolf Hitler prohibited the party in 1933 under the Enabling Act and party officials were imprisoned, killed or went into exile. In exile, the party used the name Sopade. The Social Democrats had been the only party to vote against the Enabling Act while the Communist Party was blocked from voting. In 1945, the Allied occupants in the Western zones initially allowed four parties to be established, which led to the Christian Democratic Union, the Free Democratic Party, the Communist Party and the SPD being established. In the Soviet zone of occupation, the Soviets forced the Social Democrats to form a common party with the Communists (Socialist Unity Party of Germany or SED). In the Western zones, the Communist Party was later banned by West Germany's Federal Constitutional Court in 1956. Since 1949, the SPD has been one of the two major parties in the Federal Republic of Germany, with the other being the Christian Democratic Union. From 1969 to 1982 and 1998 to 2005, the Chancellors of Germany were Social Democrats whereas the other years the Chancellors were Christian Democrats. Shortly before the reunification of Germany in 1990, the East German Social Democratic Party merged into the West German SPD. The SPD was established as a Marxist party in 1875. However, the Social Democrats underwent a major shift in policies reflected in the differences between the Heidelberg Program of 1925 which "called for the transformation of the capitalist system of private ownership of the means of production to social ownership" and the Godesberg Program of 1959 which aimed to broaden its voter base and move its political position toward the centre. After World War II, under the leadership of Kurt Schumacher the SPD re-established itself as a socialist party representing the interests of the working class and the trade unions. However, with the Godesberg Program the party evolved from a socialist working-class party to a modern social-democratic party working within liberal capitalism. The current party platform of the SPD espouses the goal of social democracy, which is seen as a vision of a societal arrangement in which freedom and social justice are paramount. According to the party platform, freedom, justice and social solidarity form the basis of social democracy. The coordinated social market economy should be strengthened and its output should be distributed fairly. The party sees that economic system as necessary in order to ensure the affluence of the entire population. The SPD also tries to protect the society's poor with a welfare state. Concurrently, it advocates a sustainable fiscal policy that does not place a burden on future generations while eradicating budget deficits. In social policy, the Social Democrats stand for civil and political rights in an open society. In foreign policy, the party aims at ensuring global peace by balancing global interests with democratic means, thus European integration is one of the main priorities of the party. 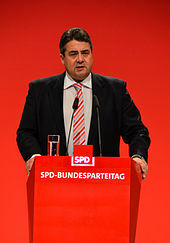 The SPD supports economic regulations to limit potential losses for banks and people. They support a common European economic and financial policy and to prevent speculative bubbles as well as environmentally sustainable growth. The SPD is mostly composed of members belonging to either of the two main wings, namely the Keynesian social democrats and Third Way moderate social democrats belonging to the Seeheimer Kreis. While the more moderate Seeheimer Kreis generally support the Agenda 2010 programs introduced by Chancellor Gerhard Schröder, the Keynesian social democrats continue to defend classical left-wing policies and the welfare state. The classical left-wing of the SPD claims that in recent years the welfare state has been curtailed through reform programs such as the Agenda 2010, Hartz IV and the more economic liberal stance of the SPD, which were endorsed by centrist social democrats. As a reaction to the Agenda 2010, there was in 2005 the ascension of an inner party dissident movement which led ultimately to the foundation of the new party Labour and Social Justice – The Electoral Alternative (Arbeit & soziale Gerechtigkeit – Die Wahlalternative, WASG). The WASG was later merged into The Left (Die Linke) in 2007. Before World War II, as the main non-revolutionary left-wing party the Social Democrats fared best among non-Catholic workers as well as intellectuals favouring social progressive causes and increased economic equality. Led by Kurt Schumacher after World War II, the SPD initially opposed both the social market economy and Konrad Adenauer's drive towards Western integration fiercely, but after Schumacher's death it accepted the social market economy and Germany's position in the Western alliance in order to appeal to a broader range of voters. It still remains associated with the economic causes of unionised employees and working class voters. In the 1990s, the left and moderate wings of the party drifted apart, culminating in a secession of a significant number of party members which later joined the socialist party WASG, which later merged into The Left (Die Linke). Geographically, much of the SPD's current-day support comes from large cities, especially of northern and western Germany and Berlin. The metropolitan area of the Ruhr Area, where coal mining and steel production were once the biggest sources of revenues, have provided a significant base for the SPD in the 20th century. In the Free Hanseatic City of Bremen, the SPD has governed without interruption since 1949. In southern Germany, the SPD typically garners less support except in the largest cities. At the 2009 federal election, the party lost its only constituency in the entire state of Bavaria (in Munich). Small town and rural support comes especially from the traditionally Protestant areas of northern Germany and Brandenburg (with notable exceptions such as Western Pomerania where CDU leader Angela Merkel was re-elected in 2005) and a number of university towns. A striking example of the general pattern is the traditionally Catholic Emsland, where the Social Democrats generally gain a low percentage of votes, whereas the Reformed Protestant region of East Frisia directly to the north, with its strong traditional streak of Anti-Catholicism, is one of their strongest constituencies. Further south, the SPD also enjoys solid support in northern Hesse (Hans Eichel was mayor of Kassel, then Hesse's Minister-President and finally Finance Minister in the Schröder administration while Brigitte Zypries served as Justice Minister), parts of Palatinate (Kurt Beck was party leader until 7 September 2008) and the Saarland (political home of one-time candidate for federal chancellor Oskar Lafontaine, defected from the SPD in 2005). The SPD, at times called SAPD, participated in general elections determining the members of parliament. For the elections until 1933, the parliament was called Reichstag, except of the one of 1919 which was called the National Assembly and after 1949 when it was called Bundestag. Note that changes in borders (1871, 1919, 1920, 1949, 1957 and 1990) varied the number of eligible voters whereas electoral laws also changed the ballot system (only constituencies until 1912, only party lists until 1949 and mixed system thereafter), the suffrage (women vote since 1919), the number of seats (fixed or flexible) and the length of the legislative period (three or four years). The list begins after the SPD was formed in 1875, when labour parties unified to only form the SPD (then SAPD, current name since 1890). Banned. National Socialist German Workers Party sole legal party. The party is led by the Leader of the Social Democratic Party. He/she is supported by six Deputy Leaders and the party executive. The current leader is Andrea Nahles. The current Deputy Leaders are Manuela Schwesig, Ralf Stegner, Olaf Scholz, Thorsten Schäfer-Gümbel, Natascha Kohnen and Maria Luise "Malu" Dreyer. As Germany is a federal republic, each of Germany's states have their own SPD party at the state level. ^ "SPD verliert Mitglieder". JUNGE Freiheit. Retrieved 18 February 2019. ^ a b Merkel, Wolfgang; Petring, Alexander; Henkes, Christian; Egle, Christoph (2008). Social Democracy in Power: the capacity to reform. London: Taylor & Francis. ISBN 0-415-43820-9. ^ a b Almeida, Dimitri (2012). The Impact of European Integration on Political Parties: Beyond the Permissive Consensus. CRC Press. p. 71. ISBN 978-1-136-34039-0. Retrieved 14 July 2013. ^ a b Ashley Lavelle (2013). The Death of Social Democracy: Political Consequences in the 21st Century. Ashgate Publishing, Ltd. p. 7. ISBN 978-1-4094-9872-8. Retrieved 18 July 2013. ^ Christian Krell (2009). Sozialdemokratie und Europa: Die Europapolitik von SPD, Labour Party und Parti Socialiste. VS Verlag für Sozialwissenschaften/Springer-Verlag. ^ "Greek debt crisis: Violence in Athens ahead of Germany vote". BBC News Online. 26 February 2015. Retrieved 26 February 2015. ^ "Progressive Alliance: Sozialdemokraten gründen weltweites Netzwerk". Der Spiegel. Hamburg, Germany. 22 May 2013. Retrieved 10 May 2015. ^ "Sozialdemokratie: "Progressive Alliance" gegründet". Frankfurter Allgemeine Zeitung. 22 May 2013. Retrieved 10 May 2015. ^ "Sozialistische Internationale hat ausgedient: SPD gründet "Progressive Alliance"". 22 May 2013. Retrieved 10 May 2015. ^ Brustein, William (1996). Logic of Evil: The Social Origins of the Nazi Party 1925–1933. New Haven, Connecticut: Yale University Press. p. 131. ^ Cooper, Alice Holmes. Paradoxes of Peace: German Peace Movements since 1945. Ann Arbor, Michigan: University of Michigan Press. p. 85. ^ Nils Schnelle (2007). Die WASG – Von der Gründung bis zur geplanten Fusion mit der Linkspartei. Munich. ^ "Schroeder wins second term". Retrieved 17 October 2018. Orlow, Dietrich. Common Destiny: A Comparative History of the Dutch, French, and German Social Democratic Parties, 1945–1969 (2000) online. Maxwell, John Allen. "Social Democracy in a Divided Germany: Kurt Schumacher and the German Question, 1945-1952." Ph.D dissertation, West Virginia University, Department of History, Morgantown, West Virginia, 1969. McAdams, A. James. "Germany Divided: From the Wall to Reunification." Princeton University Press, 1992 and 1993. Eric D. Weitz, Creating German Communism, 1890-1990: From Popular Protests to Socialist State. Princeton, NJ: Princeton University Press, 1997. David Priestand, Red Flag: A History of Communism," New York: Grove Press, 2009.